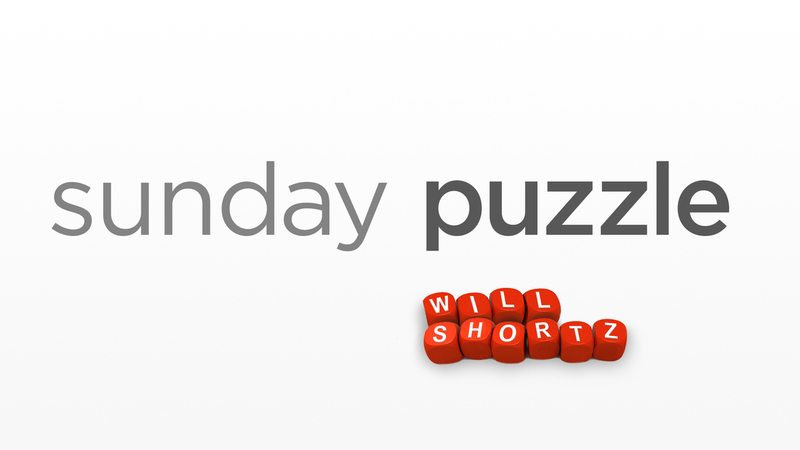 Sunday Puzzle: Yo! NPR's Lulu Garcia-Navarro and puzzlemaster Will Shortz play the puzzle with this week's winner Scott Meidroth from St. Louis. On-air challenge: This week's puzzle is titled "Yo!" Every answer is a familiar two-word phrase or name in which the first word ends in Y and the second word starts with O. 12. Singer with the 1964 hit "Oh, Pretty Woman"
13. Anton Chekhov play, with "The"
14. Classic Bertolt Brecht "play with music," with "The"
Last week's challenge: This challenge came from Ben Bass of Chicago. Take the title of a famous Hollywood flop. Change an A to an R, then rearrange the letters to spell a famous box office hit — which went on to spawn sequels. What films are these? Next week's challenge: Name part of the human body. Switch the first two letters to get a two-word phrase for something that is worrisome. What is it? If you know the answer to next week's challenge, submit it here. Listeners who submit correct answers win a chance to play the on-air puzzle. Important: Include a phone number where we can reach you Thursday, May 31 at 3 p.m. ET.